If you want a car that can give you everything, look no further than the 2018 Chevrolet Cruze. This baby truly does have it all, from practical performance and impressive fuel efficiency to loads of innovative technology and plenty of storage space. All of this is wrapped up in the Cruze’s fun and sporty packaging. Once you try out the all-new 2018 Chevrolet Cruze, you won’t want to settle for anything less. You can truly be confident that you’re getting the best because the 2018 Chevrolet Cruze has the awards and ratings to prove it. The Cruze has an 8.5 out of 10 from U.S. News and World Report, which is based on critics’ reviews, performance, interior design, safety, and reliability. And, as if that wasn’t enough, the 2018 Chevrolet Cruze scored a five-star safety rating from the National Highway Traffic Safety Administration (NHTSA). With a score like that, you can be confident that the Cruze will keep you and your passengers safe while you’re on the road. In your on-the-go lifestyle, you want to stay connected no matter where life takes you. The 2018 Chevrolet Cruze allows you to do just that will all of the innovative technology packed into it. The 2018 Cruze comes standard with Chevrolet MyLink and a seven-inch diagonal color touchscreen allowing easy access to music, maps, and more. The system also works with both Apple CarPlay™ or Android Auto™ so you can use your smartphone while still keeping your focus on the road. Enjoy all your music to its fullest with the six-speaker sound system and discover new music to love with the three-month trial of SiriusXM Satellite Radio. And, you’ll never have to worry about using up your data plan with the available built-in 4G LTE Wi-Fi hotspot. As you can see, the Cruze makes sure that you can do the things that matter whenever you want and wherever you are. The 2018 Cruze takes the challenge out of choosing an engine by offering two potential engines, each with the ability to give you the power and fuel economy you want from your car. Rather than offering many specialized options, the Cruze has two all-around solid options to help take the stress out of choosing. The standard engine is a 1.4-liter turbo that offers 153 horsepower and up to 40 MPG on the highway in the sedan. This engine gives you impressive gas mileage without sacrificing on power. 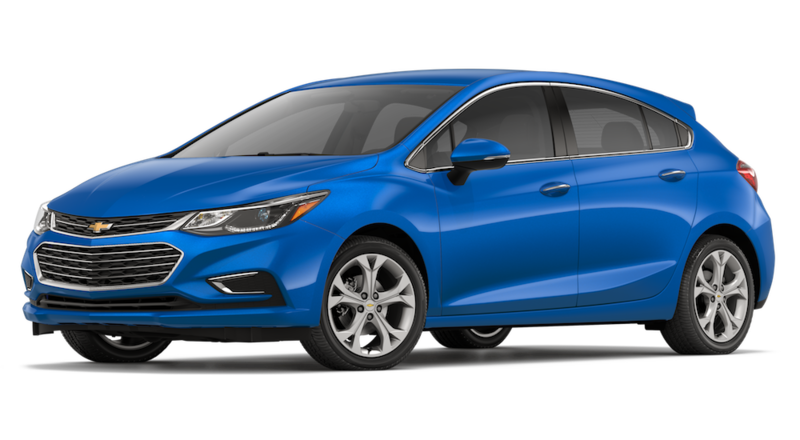 Also available for the 2018 Chevrolet Cruze is the 1.6L turbo diesel engine This baby will you get you a whopping 52 MPG on the highway in the sedan body style, and it can also get you 702 miles of range out of a single tank of gas. Plus, this engine is packed full of power with 240 lb.-ft. of torque. This way, you’re not sacrificing power for fuel economy or vice versa. Each engine is paired with a six-speed manual transmission. Front wheel drive is standard on the 2018 Cruze, as are four-wheel antilock disc brakes and the StabiliTrak electronic stability control system. All of these features work together to make sure that you get a smooth, enjoyable ride every time. The 2018 Cruze received a five-star safety rating from the NHTSA and has many features that will keep you and your family safe while you’re on the road. As a company, Chevrolet has a threefold approach when it comes to safety: prevent, protect, and respond. The Cruze has features that help Chevrolet as a company meet all three of these goals. To prevent accidents from occurring, the 2018 Cruze comes standard with a rear-vision camera. Available safety features that also help prevent accidents include Forward Collision Alert, Rear Park Assist, Lane Keep Assist with Lane Departure Warning, Lane Change Alert with Side Blind Zone Alert, and Rear Cross Traffic Alert. These safety features and driver assist technologies all work together to keep your ride as uneventful as possible. If an accident does occur, the 2018 Chevrolet Cruze is designed to protect each and every occupant of the vehicle. It comes standard with 10 airbags and is built with a high-strength steel safety cage. No matter what happens, the Cruze has your back. Plus, a free trial of OnStar’s safety and security plan, including automatic crash response, is included in the first month. Should an accident occur, a representative will contact you to make sure you’re all right and can contact emergency response personnel even if you are unable to respond. These safety features will all work together to keep you as safe as possible between point A and point B. If you have or will soon have teenagers that need to learn to drive, the 2018 Cruze’s Teen Driver Technology will be especially handy for you. This technology will mute the audio system until all the vehicle’s occupants are buckled up and will automatically turn on any safety features available. The system also offers an in-vehicle report card, so you can know how your new driver is doing. The all-new Chevrolet Cruze features an impressive sculpted design, bold and aerodynamic in appearance. Available in both sedan and hatchback body styles, the Cruze has a palette of 10 designer colors ranging from subtle neutrals to bright pops of color, fitting any aesthetic preferences. The 2018 Cruze also includes luxury details like the available projector-beam headlamps and available LED daytime running lamps. Pump up the volume even more with the special edition Redline series. Available on the LT with RS Appearance package, you’ll get black 18-inch wheels with red accents, black mirror caps, black window trim, a black grille, black fog lamp bezels, and Chevrolet’s signature black bow ties. These special accents give the Cruze a tougher image on the streets. The 2018 Cruze is the pinnacle of modern design, creature comforts, and serious storage. Bring the whole family with you, as the 2018 Chevrolet Cruze can seat five people comfortably. Upgrade your comfort levels with the Premier trim, which comes standard with heated front seats and optional heated rear outboard seats. That way, you’ll never worry about being cold during the winter months. Whether you’re going camping, working on your latest DIY project, or taking the kids to practice, the Cruze has all the space you need to get the job done. The hatchback version of the Cruze offers an impressive 47.2 cubic feet of storage with the seats down, so you’ll never want for space. Located in Cincinnati, Ohio, McCluskey Chevrolet has been providing the community with high-quality and affordable new and used Chevrolets and quality service for years. Only McCluskey Chevrolet will help you find the perfect Chevrolet Cruze or any other quality Chevrolet vehicle at a great price with the assistance of our friendly and knowledgeable staff. We at McCluskey Chevrolet are proud to sell America’s safest, most dependable brand of vehicles, and you can expect us to have a wide availability of the popular 2018 Chevrolet Cruze.